2014 is about embracing change and amping up the level of everything in my life. With that in mind, I’d love to do a Questions & Answer video on my YouTube channel and share a little bit of myself with you. Most of the videos on my channel have been on beauty and makeup products, but it would be nice to add another dimension to my channel. So, if you’ve got questions…I got answers. So, please, do me a great big favor and click the picture below. It will take you to a very easy and quick “Ask AllThingsTashia” Google form or you can simply click here. I’ll answer any reasonable question, so ask away. I’d love to film my Q & A video before the end of January, so I will close this form on January 19, 2014. I’m so excited to see what you will ask. 🙂 Thank you in advance for taking time to ask me questions. Don’t be alarmed!!! I’ve been making site changes to improve my blog for my 1st blogging anniversary (January 28, 2014). Do you like the black bird nature background or would you be okay will a more clean approach to my blog? Of the three options, which would you pick 1, 2, 3 or 4? Option 1 is how my blog was originally. Right now, my blog is a hybrid between option 1 & 2 (option #4). However, I thinking of getting rid of the black birds and going with the fun and girly pink polka dots in option #2. I could also do a more minimalistic layout with option #3 and keep the blog fresh, clean, and elegant. This is a short VLOG of my hiking trip to Carlsbad Caverns. I was thinking about offering these samples on http://www.makeuptalk.com, but wanted to share it with those near and dear. You know what they say… “charity begins at home.” So with that being said, if you are an ivory girl and would truly appreciate these samples, please send me a short email saying so to allthingstashia@gmail.com. I will pick the receiver of the samples randomly, notify them through email and request a mailing address. **Please note: I am willing to mail the samples anywhere in the USA. However, I am not sure what international rules for mailing samples are and would not like the samples to go to waste, so I will offer samples to my international happy friends once I’ve had time to research the procedures. The cut off for emailing me regarding the samples is May 19, 2013 at 12:00 noon PST. On the chance that I receive zero requests, I will immediately offer the samples on Makeup Talk. Are your samples looking something like this? 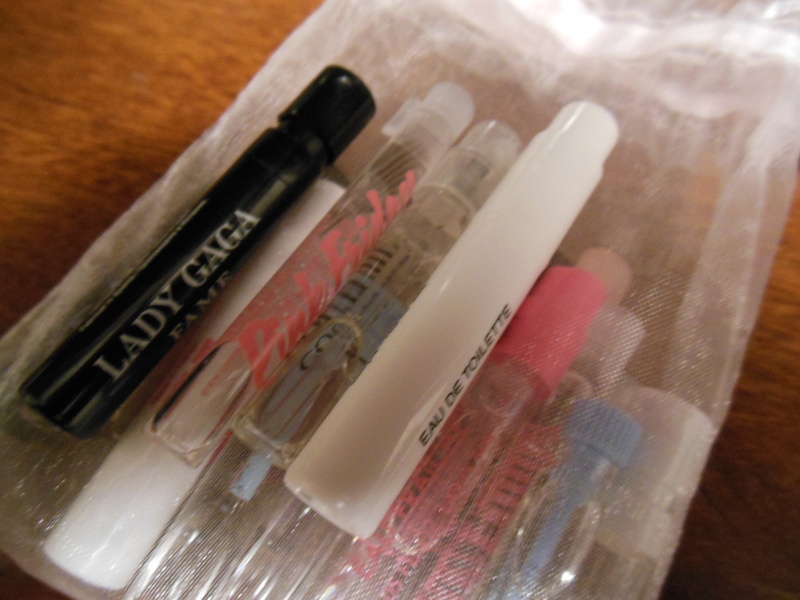 To keep the perfume vials and foil packets organized after the cardboard removal, I used a sachet pouch to store all of my perfume samples and put all of my foil packets in an empty Glossybox. Now, I have more room in my sample drawer for other items. What do you think? 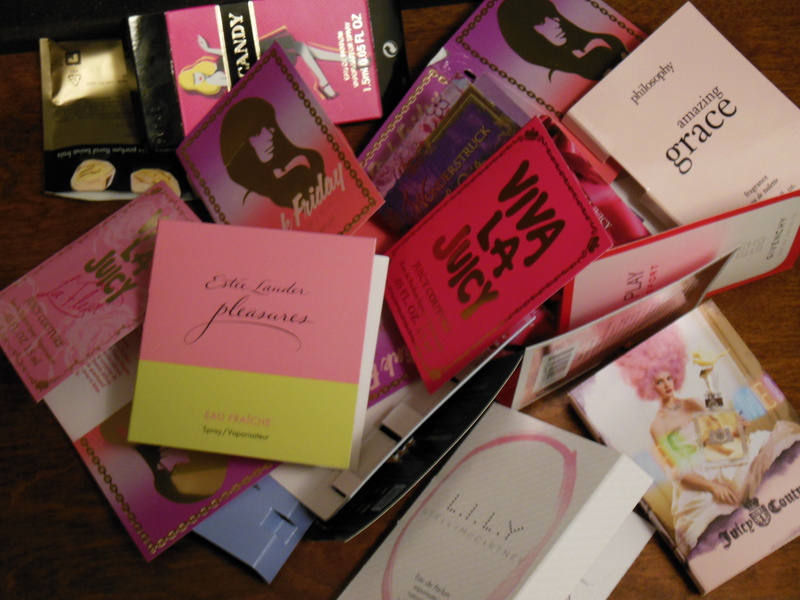 How do you organize your beauty samples?